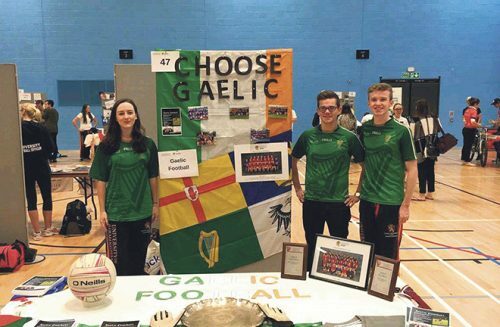 “I’ve heard of it, but don’t know how to play it” and “I would, but I’m not Irish”, the perpetual responses from students faced with the prospect of playing Gaelic football at university. 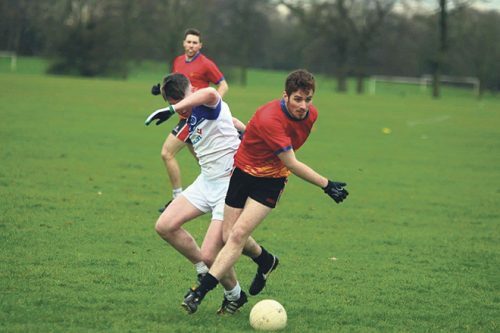 It feels as if Gaelic Football only appeals to a very niche group of people and with so many new sports to try, 56 at the University of Birmingham (UOB) to be exact, it’s no surprise our sport struggles to get a foot in compared to others. Sure enough back in 2009, when the club was first set up, they struggled for interest. The ladies team only had three people turn up to its first training session and there were barely enough members all together to be classified as a “club” by university standards. Founder Joe Hopkins had to gather up his course mates and house mates to make up the numbers. Funding remained a major issue with Joe and other club members often paying for club expenses out of their own pockets. 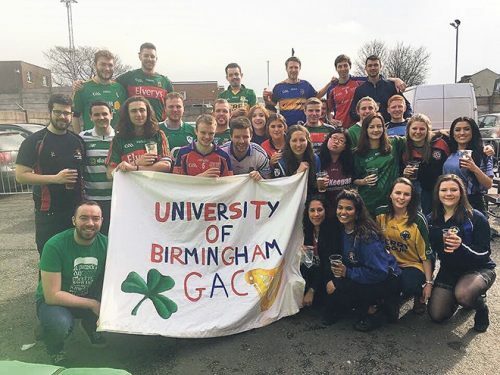 Despite this, for the past few years UOB have had one of the largest Gaelic Football clubs in the country with two Men’s and a Ladies’ team, with total membership at over 60 players. The Ladies’ team even spans two universities with students from Birmingham City University also having an active role within the club. The hard work put in to promote the club and the sport pays off year after year. 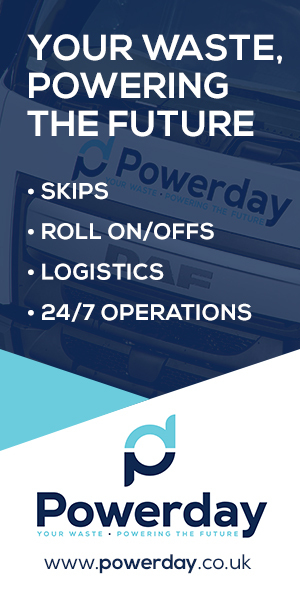 This is seen by our strong membership numbers and more interestingly their backgrounds. From a handful of Irish nationals and Irish diaspora, to some members coming from France and Spain. Our club at UOB is truly diverse. It’s common for most of our new players to have never played before, with many of them having only ever played football and rugby prior to university. This presents unique challenges every September as our coaches train up our new recruits to a competitive standard. 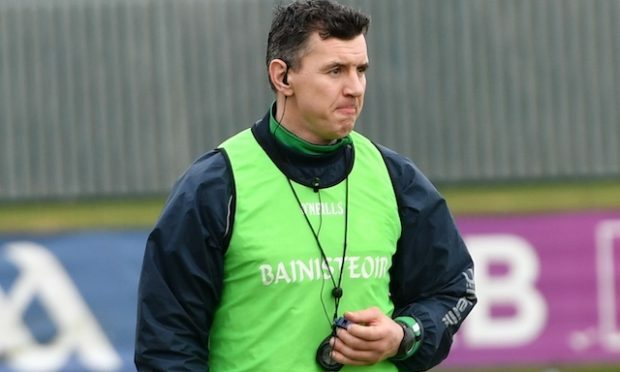 The coaches themselves, in homage to Gaelic Football’s amateur roots, are students themselves and do it for their own enjoyment and good of the game. It’s a great credit to them that every year Birmingham are at the top of their game competing with the best. The university season consists of league games from October to February before the season finale, the National Championships, in mid- March. Birmingham have had glory in all forms of competition. The Men’s side won the Division 2 championships for two consecutive seasons in 2013 and 2014. 2014 proved to be a particularly prosperous year with the Ladies’ team also winning the Women’s Division 2 Championship. Despite successes in previously years, 2017 proved a painful year for the Men’s sides with the 1sts coming third in the Midlands North League before defeat to the University of Liverpool in the final of the Division 2 Championship. It was a similar story for the 2nds. Despite only playing two league games all season in the Midlands South and East league, we reached the final of the Division 3 Championship losing by a point after extra-time to Kingston University. The Ladies fared much better in the league, winning every game. But it was another final defeat in the championships to the University of Glasgow. 2017/18 has gotten off to an excellent start for the Men’s 1sts with victory away at expected league title rivals, Nottingham. The Ladies’ season has been restructured to feature a handful of small tournaments rather than a league like in previous years. Their first tournament was scheduled for 18 November. 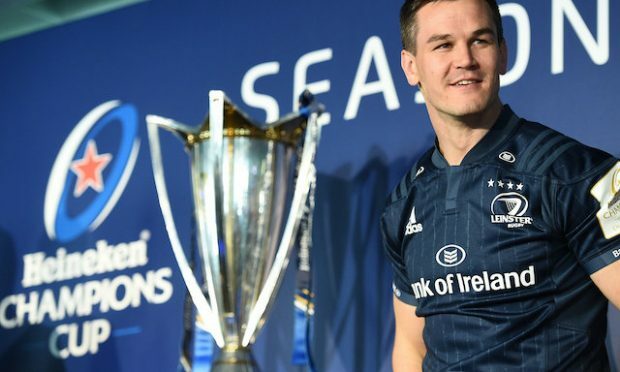 The urge to make up for last season’s heartache will hopefully see this year’s squads hit new heights in the fight to win the championships we came so close to. On top of competitive league and championship games our highlight of the year is our annual International Rules fixture vs the University’s Aussie Rules club. The first half is played between the Ladies’ teams and the second half is between the Men’s sides. The only game in our season to be played on the university’s main pitch. The contest always brings in big crowds. The game itself is pretty brutal as Aussie rules style tackles are permitted. Undeterred by the physicality, the 2016 event saw the Gaelic team triumph, mainly through the excellent first half display from our Ladies’ team. However, our on the pitch achievement doesn’t impact on our demeanour off it. University sports teams are often ridiculed with bad reputations for their rowdy behaviour and drinking antics. We’re different though, we’re not big headed like rugby or football “lads”, and we’re proud of that. We don’t have humiliating initiations or try to degrade members of other teams. Our club has more of a family feeling to it and it shows. There have been numerous relationships formed within the club and even a baby, Tara and Sam Thompson’s son Fin. The club is making waves not just on campus but in the wider Birmingham area as well. Many of our players, some of whom had never tried Gaelic football before university, play for West Midland’s club sides including Casement’s, St Brendan’s and Mitchell’s. The club tries to spread the game in the community and last year a few of our members gave up their free time to coach students at Wheelers Lane School. Away from the pitch, we participate in Birmingham’s St Patrick’s Day Parade every year, promoting university level football to thousands. 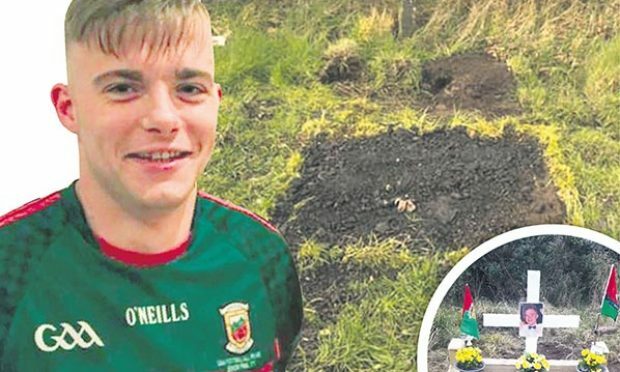 As we are a small club and a sport, life is still tough. Every year we have a mass exodus of players as another year graduates and, as previously mentioned, it’s hard to recruit. It’s a problem shared by all university Gaelic teams, with many of our fixtures being postponed due to our opponents being unable to field a team. This will improve with time and hopefully the sport will continue to grow and increase in popularity. And with increased popularity the sport will be taken more seriously by our own university. Currently we get the feeling we are overlooked in everything from training arrangements to provision of transport to get to games. We even have to travel 10 miles for our home games, at Páirc na hÉireann (Warwickshire GAA), as the university does not currently have a pitch on campus. But we recognise the challenges we face and know how to fix them. We have a dedicated committee who are always determined to do the best for the club. The wider Gaelic community in Birmingham is also here to help. Warwickshire GAA allow us to use their pitch for no cost and Mitchell’s recently donated balls to the Ladies’ team. It’s this spirit that will drive the sport forward in the UK. For the future at the University of Birmingham, we would like to welcome even more new players and grow the club. And who knows, we might even get our own pitch on campus.